Looking good doesn’t need to be costly or time consuming. It’s simply a matter of picking up a few daily beauty habits, and you are on your way to looking your best every day. Here are a few daily beauty habits you should really pick up if you haven’t already. Our skin cells regenerate every day while we sleep, and one way to keep your skin smooth and supple is by exfoliating it regularly. Exfoliated skin also absorbs moisturizers more easily, keeping it hydrated. Place your exfoliating products within easy reach in your bathroom, and you’ll remember to exfoliate more often. A natural moisturizer comes in the form of oils, and coconut oil or olive oil are especially useful. Multipurpose and easily available, you can use them all over—from your skin to your hair and your face to your body, oils are a great way to keep your skin moisturized. Cleaning your makeup brushes is a must to prevent bacteria from growing in them, especially if you have sensitive skin or suffer from any skin conditions. Beauty experts recommend washing them at least twice a month or once a week ideally. Simply run them through warm soapy water then rinse them out with lukewarm water. Dab off the excess water and leave them out to dry overnight. Water can help to keep your skin looking fresh and beautiful by flushing toxins out of your body. So drink a tall glass of water first thing in the morning. Add lemon and honey to hot water if you wish, and it will hydrate your system. 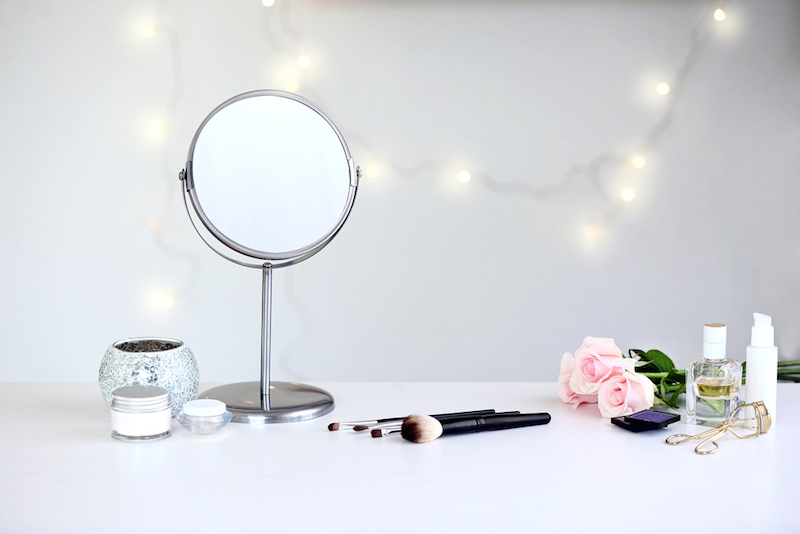 To keep your pores free and unclogged, remove all your makeup every night. Yes, all of it. That means any eyeliner, lip stain or foundation you have on. This can prevent breakouts and dull skin caused by clogged pores. Hands are often one of our most neglected body parts. Due to frequent washing and being exposed to dry air, they tend to become dry and nails become brittle. Moisturize with a thick, greasy hand cream at night—this will help your hands, nails and cuticles feel and look better. Nails will grow out stronger and longer and will be less susceptible to breakage. It’s important to wear sunscreen under your makeup as the SPF that comes with your makeup usually doesn’t provide sufficient coverage. Make sure the bottle says ‘broad spectrum’ and is at least SPF 30. Help your hair retain essential oils by only washing your hair every 2-3 days. Wash your hair once a week with conditioner only to clean it gently and to fight frizzy hair. Consuming large amounts of sugar, caffeine and alcohol could wreak havoc on your skin. Cut down or eliminate these entirely to see the difference it makes. Plus remember the more natural the food the better, so avoid processed foods when possible. Serums pack a punch when it comes to adding hydration and active ingredients. In a highly concentrated dose, they are absorbed into the skin quickly and you can find one to suit your particular skin type. How many of these daily beauty habits are you already doing? If more than three, props to you! If not, incorporate one or two of these beauty habits into your daily beauty routine and looking beautiful will be a breeze!